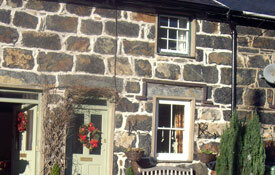 Pet friendly holiday accommodation in the heart of Snowdonia in North Wales. Excellent location. Sleeps up to 4 guests. Dogs welcome. To go back to Wales pet friendly accommodation click here. Hafan Holiday Cottage, Gwynedd is a charming Grade 2 listed cottage located in the lovely village of Beddgelert in the heart of Snowdonia. Located in the center of the village opposite the Afon Glaslyn and surrounded by mountains, it provides convenient access to walks, river, coast, pubs and eating places as well as the newly re-opened Welsh Highland Railway. Dogs welcome. 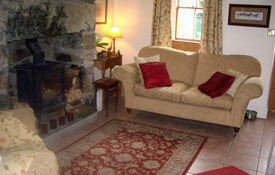 The accommodation, which is non-smoking, comprises an open plan lounge / kitchen with stone fireplace and tiled floor. 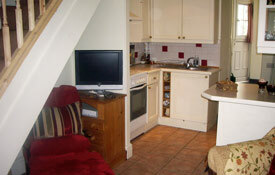 The well-equipped kitchen area includes electric cooker, refrigerator, kettle and toaster. A utility area houses a washer-drier, microwave and space for boots and coats. There is a newly fitted ground floor shower room. Stairs from the lounge lead to the first floor which has two bedrooms; one with double, the other with a four foot bed. Bed linen is provided. The cottage is fitted with some storage heaters. Electricity is by card meter. There is also an open fire. Coal and logs are available in the village. We also offer WiFi access. Car parking is on the road or the public car parks in the village. Porthmadog is 7 miles away, Caernarfon 12 miles. 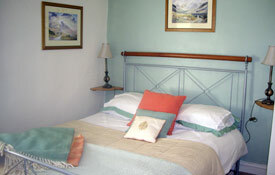 Locally there are some exellent inns and eating places which provide snacks and meals. A list of some of these with numbers is provided, and we welcome suggested additions to this. The cottage is ideally located for the many facilities within the Snowdonia National Park; walking, cycling, golf, watersports and climbing. Beaches at Black Rock Sands, Criccieth and Harlech. Castles at Caernarfon, Conway and Harlech. Narrow gauge railways - Festiniog, Welsh Highland, Llanberis Lake, Snowdon Mountain. Plus the wonderful scenery - lakes, rivers and mountains, including Snowdon of course. Facilities for pets: Bowls and bedding provided if required. Large private garden backing on to the Mountain and Silver Birch woods. No additional charge for up to 2 medium sized dogs.